Combine the rice, black-eyed peas, bell pepper, green beans, and green onions and set aside. Puree the vinaigrette ingredients except oil in a food processor. 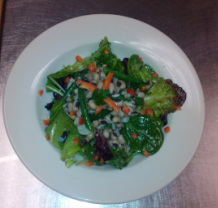 Toss all but 6 tablespoons of the vinaigrette with the black-eyed pea mixture. Toss mixed greens with remaining vinaigrette and place as a bed on cold plates. Mold 1 cup of hoppin' john mixture onto each plate of greens. Chef: beans could be cooked slightly more, but OK, "confetti" of red peppers looks nice as garnish, rice nicely cooked, dressing just right--gives good moistness and shine to dish, likes that it is generous with green beans. There should be less greens underneath because the main part of the dish is the hoppin' johnny, not the mixed greens, molding them makes them look more refined. Personal/Team: Good flavor, good mix of all ingredients, none stand out, all just blend well. This dish is a good vegetarian dish because it offers both the beans and rice for a complete protein. Can soak black-eyed peas ahead, will save about 30 minutes on cook time. Don't salt water with beans because they won't cook as evenly or as fast; season after cooking. Want to be sure they are all the way cooked, but not mushy; keep an eye on them. In Latin cultures, they use an herb called epizote to help prevent gas when eating beans,it does not add flavor, just helps the body breakdown the beans better; it is not often available in US.except in Latin markets.